Finding allergy-free snacks and desserts can be challenging on a regular basis at home. Finding them on vacation can be almost impossible…which is why many of us fill our suitcases with foods that we trust! Fortunately, Disneyland does have quite a few options for most allergies. 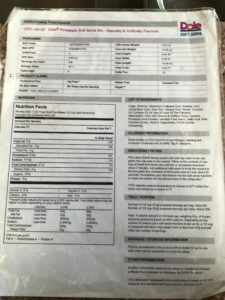 It sometimes takes some searching to find these items, so I created a list of treats that I have found to be free of many common allergies. 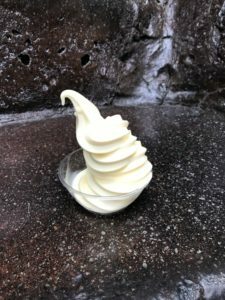 Disneyland’s most iconic treat is actually a great option for most allergies – the Dole Whip! For those who have never heard of this delicious dessert (Who am I kidding? Dessert? I would eat one for dinner! ), it is a soft-serve pineapple “ice cream” that is basically the best thing you will ever eat. Seriously. And, it is dairy-free!! Woo woo! If you want to take it up a notch, try the Dole Whip Float, where the soft serve is served in a cup with delicious, cold pineapple juice. Can you say yum?!? 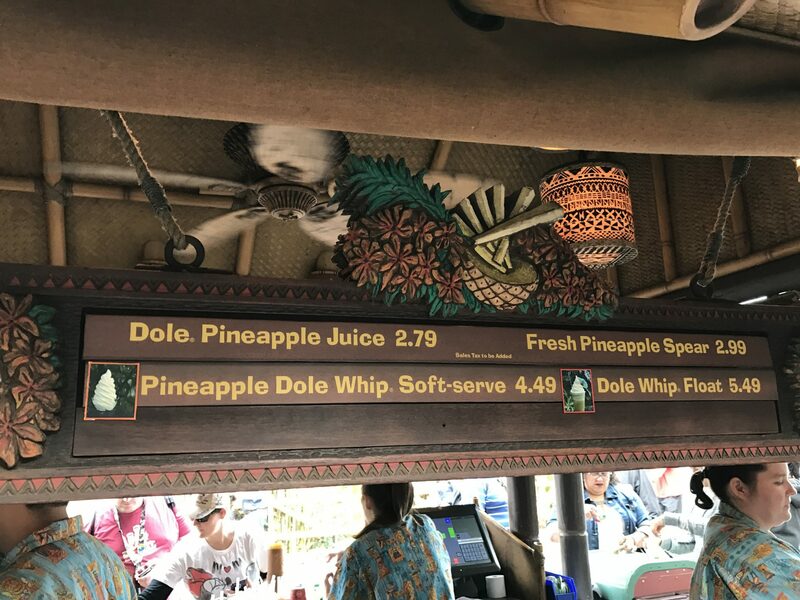 Find Dole Whips at the Tiki Juice Bar next to the “world-renown” Tiki Room. 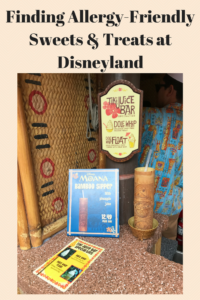 During the hot summer months, grab your Dole Whip and head inside the Tiki Room…”where all the birds sing words and the flowers croon” (try to get that song out of your head now!). It is a perfect spot to cool off while enjoying one of Disneyland’s original attractions. There are usually two lines at the Tiki Juice Bar, and the one inside the Tiki Room waiting area usually has a much shorter line. Learn how to make your own Dole Whip style breakfast (yes, breakfast!) at home by reading Military Diva’s article. 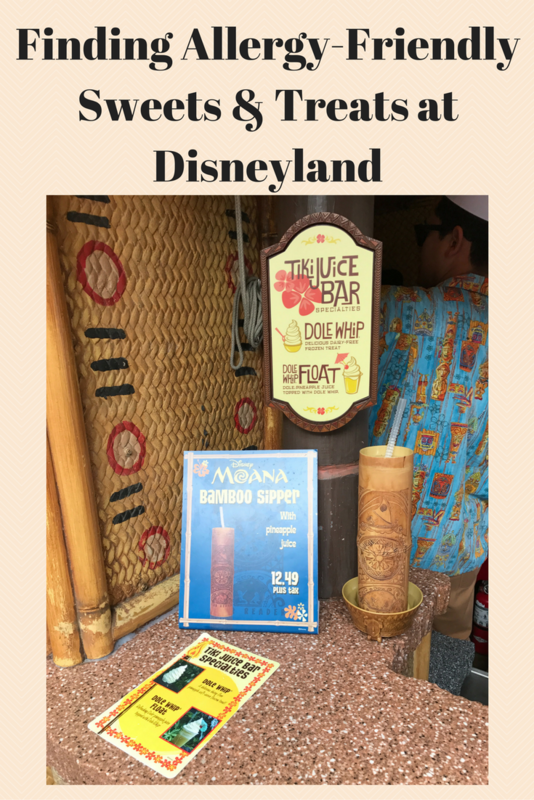 Read what Superhero Diva thinks about delicious these Dole Whips here. 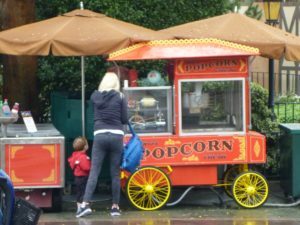 Some of the carts and outdoor shops through the Park have allergy-friendly options, which are mentioned below. Diva Tip: You can ask any of the carts for a current ingredient list (and please do!). Freeze dried Fuji Apple (and other fruit) Crisps taste a bit like eating apple flavored air. They won’t fill you up, but they will temporarily satisfy a craving for something tart. Chocolate Chip Crunchy Cookies (gluten, nut, dairy, soy, and egg free) – These definitely live up to their “crunchy” name. They are thin, crispy cookies. They are good…just don’t expect traditional, softer cookies. 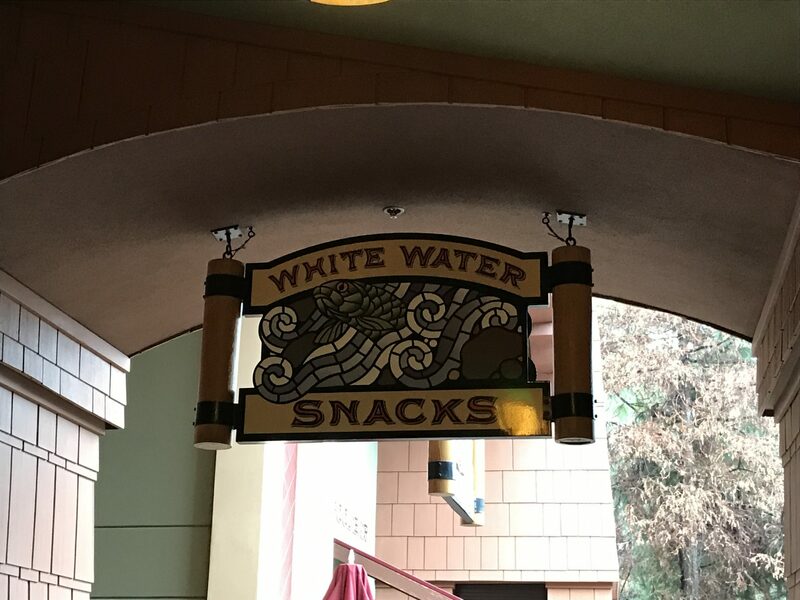 Diva Tip: “Snacks with Character” can usually be found at Pooh Corner, Candy Palace, Downtown Disney’s World of Disney, some of the Disneyland hotel gift shops (the Disneyland Hotel is your best bet), and other merchandise locations. Ask a cast member if you can’t find them. 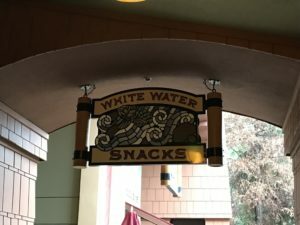 Most of the snacks in Disneyland can also be found in California Adventure (except for the Dole Whip! ), but there are a few extra items worth trying. 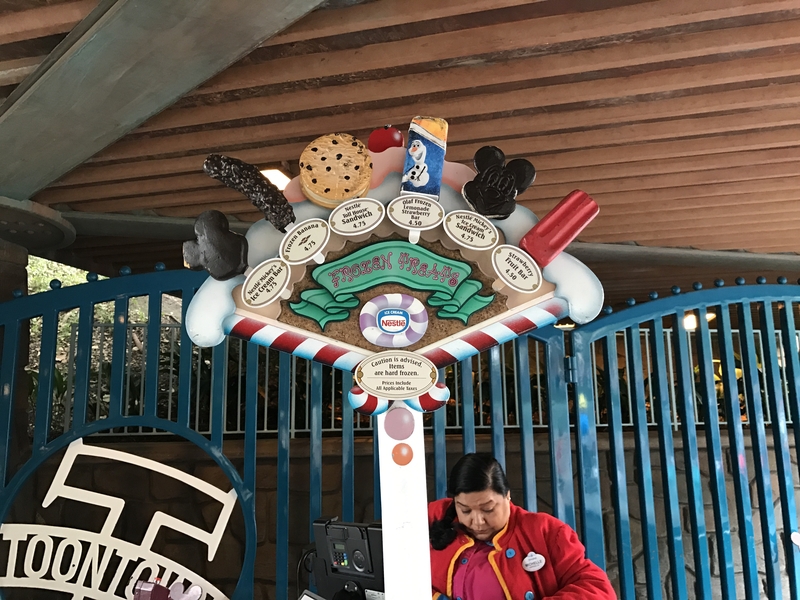 Clarabelle’s Hand Scooped Ice Cream has a mixed berry sorbet option for their hand-dipped ice cream bars. 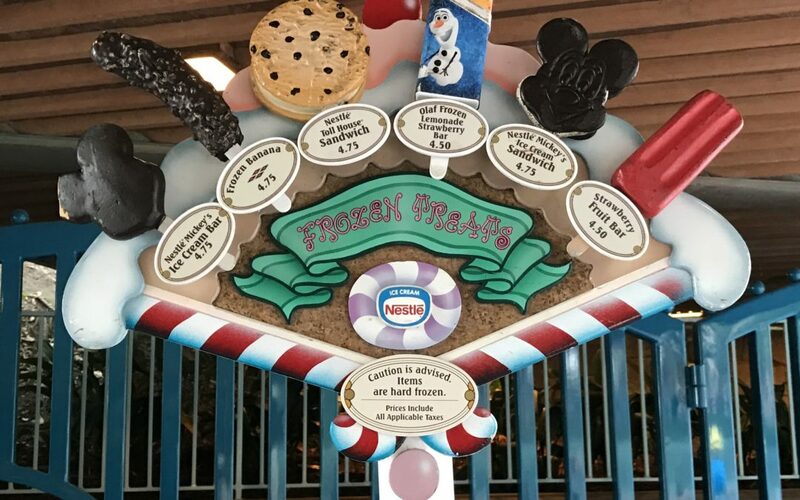 The sorbet can be dipped in milk or dark chocolate and then covered in chocolate chips, pearls, sprinkles, Mickey’s confetti, or “blue raspberry bursts” (aka Pop Rocks). Warning: they do serve ice cream that contains dairy and nuts so be sure to make them aware of your allergies. 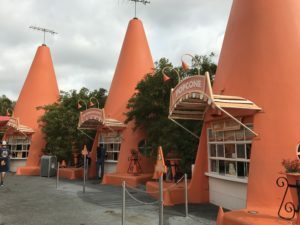 At Cozy Cone Motel, grab a Red’s Apple Freeze. It is a drink made with sweet, frozen apple juice, a dash of toasted marshmallows, and topped with a passion fruit-mango foam. Sourdough bread is one of the most allergy-friendly breads. If it works for you, check out the self-guided bakery tour hosted by Boudin Bakery in the Pacific Wharf. On this tour, you get to watch bakers prepare and bake some of the best carbs in the world – sourdough bread! The tour is kind of cheesy with Rosie O’Donnell and Colin Mochrie talking about the bread making process on TV screens above the bakery’s windows, but for some reason, I like it…maybe it is the bakery lesson…or maybe it is the free bread samples! Diva Tip: Boudin Bakery rolls and loaves can be purchased at the Pacific Wharf Cafe. Some of the restaurants in Downtown Disney have allergy-friendly desserts. In addition, Haagan-Dazs usually has a sorbet that is safe for many allergies. Diva Tip: Feel free to ask the Haagan Dazs staff if they would be willing to open up a fresh container of sorbet and use a clean scooper to reduce chances of cross contamination. Also, Sprinkles recently opened in Downtown Disney. 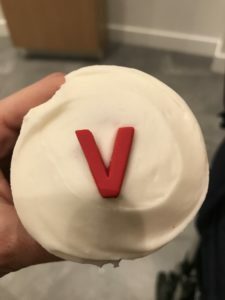 They are well-known for their delicious cupcakes and they do have a vegan, nut-free, and gluten-free red velvet cupcake with vanilla frosting. 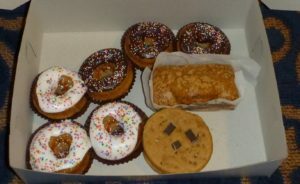 If you have a car, consider stocking up on treats from an allergy-focused bakery before arriving at the Park. Founded in New York City, Erin McKenna’s is the gold star of allergy bakeries. They are a vegan and gluten-free bakery and I have heard that everything is delicious. Their Southern California location is about 30 miles away from Disneyland. Sadly, I haven’t yet had the pleasure of trying them since we never have a car at Disneyland. However, they do ship some of their products (yay! ), which we will be doing very, very soon! Their website says they do deliver within Los Angeles, but I don’t know if they would go as far as Disneyland. 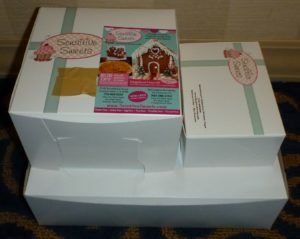 Sensitive Sweets is another allergy-friendly bakery near Disneyland, and I can personally vouch for their delicious sweets! 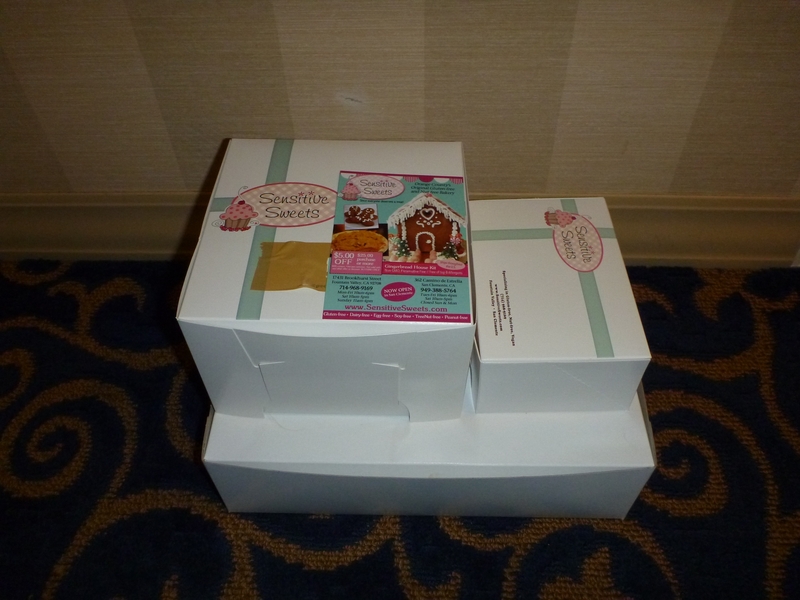 Since they are fairly close to Disneyland, they delivered our goodies right to our hotel! I was EXTREMELY excited about sharing desserts with my kiddo, so I may have went a bit overboard…chocolate and vanilla glazed donuts, sugar cookies, chocolate chip cookies, banana bread and puffed rice treats. For three people. One of whom eats very little sugar (definitely not me!). As we opened the boxes of baked goods, my kiddo pointed at each treat and asked if she was allowed to eat them. It brought my heart so much joy to say YES! Allergy families know how rare it is to have a selection of yummy-looking treats that we can all eat. We are usually happy if there is even one choice! Last Diva Tip: As usual, ALWAYS check ingredients, allergy warnings, and food handling practices for any food you want to purchase. 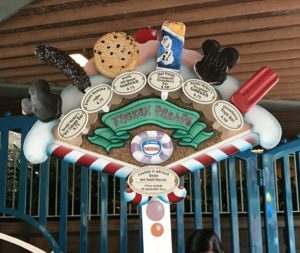 Ingredients and processes change, which is why Disneyland does not publish allergy menus on their website. I hope this list helps you plan your next Disneyland vacation! If you need FREE help booking a trip, be sure to contact Patricia at All for Dreams Travel. thank you for posting,my husband, daughter and myself all have food allergies and sensitivities. Thank you so much!!! We had no idea about any of the allergy friendly options you listed. We never eat anything there and usually don’t bring enough snacks and are starving near the end of our visit. 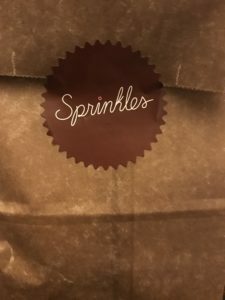 So happy to have found your site and be able to say yes when my 4 yr old asks for a treat. Thank you for taking your time to post this. I also just learned that Disneyland offers allergen friendly candy at a designated location for their Halloween party trick or treating event. I’m so glad this was helpful! 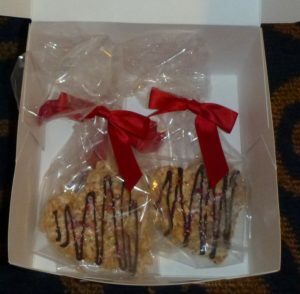 Treats are an important part of a Disney trip (at least for me!). 🙂 We have other allergy-related articles on here, as well, including one on character dining. Was the Red’s Apple Freeze dairy free? I’ve been trying to track down that info online. Yes, it was dairy-free the last time we went there! Just be sure to check the ingredients when you are there, since they can sometimes change.